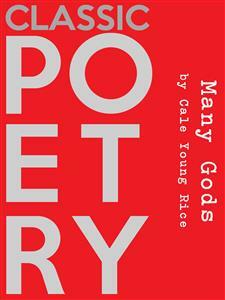 Many Gods is a book of poetry written in 1910.Cale Young Rice was an American poet and dramatist. He was born in Dixon, Kentucky, to Laban Marchbanks Rice, a Confederate veteran and tobacco merchant, and his wife Martha Lacy. He was a younger brother of Laban Lacy Rice, a noted educator. Cale Rice grew up in Evansville, Indiana, and Louisville, Kentucky. He was educated at Cumberland University and at Harvard (A.B., 1895; A.M., 1896).He was married to the popular author Alice Hegan Rice; they worked together on several books. The marriage was childless, and Cale committed suicide by gunshot during the night of January 23–24 at his home in Louisville a year after her death due to his sorrow at losing her.His birthplace in Dixon is designated by Kentucky State Historical Marker 1508, which reads:"Birthplace of Rice brothers, Cale Young, 1872-1943, noted poet and author; Laban Lacy, 1870-1973, well-known educator and author. Lacy published The Best Poetic Works of Cale Young Rice after Cale's death. Included in famous collection is poem, "The Mystic." Cale married Alice Hegan, also a distinguished Kentucky writer. Home overlooks Memorial Garden." This book is a work of poetry; its contents are wholly imagined. And fades like a far phantom from life’s door. The old peace that God is, tho all unproved. Namu Amida Butsu pity me! Namu Amida Butsu, keep my days! Namu Amida Butsu, O forgive!